Home / Exercise Bike / Fitness / Reviews / Standing Desk / Workdesk / Flexispot Deskcise Pro Review - Exercise While Working??? Flexispot Deskcise Pro Review - Exercise While Working??? Why buy an exercise bike and standing desk separately if you can get them all from Flexispot Deskcise Pro??? 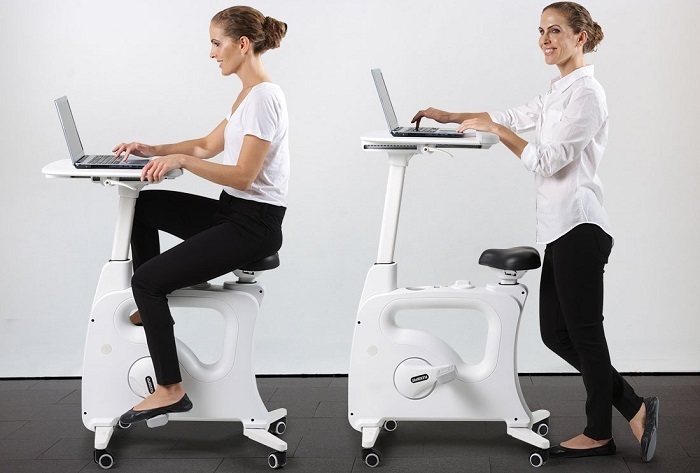 This work desk allows you to exercise (pedaling) or standing while working to reduce sedentary behaviors. Research has found excessive sedentary time to be a risk factor for many physical and psychosocial health outcomes including mortality, obesity, cardiometabolic-disease risk, cancer, stress, depressive symptoms, and poorer cognitive function. Flexispot Deskcise Pro is designed to be compact and easy enough to push around, though it’s quite heavy. Although it can't be folded its small footprint is small enough to be tucked under the cupboards when not in use. The main body has a white unibody design with a slightly triangular cutout in the middle with the 90º angle just under the seat. The look gives a rounder bump around the pedals, effectively giving it a bike look. The pedals come with a pair of flexible, soft grey pedal covers which are more conducive to use with bare feet or socks. Flexispot also has included some rubber covers to make pedaling smooth and comfortable. The cycling computer is available to keeps track of the speed, distance, RPM, calories, and time. The work surface is made of durable PVC material which is large enough (20" X 22,8") to hold 17″ laptop, mouse, phone, a cup of coffee, and other small accessories. 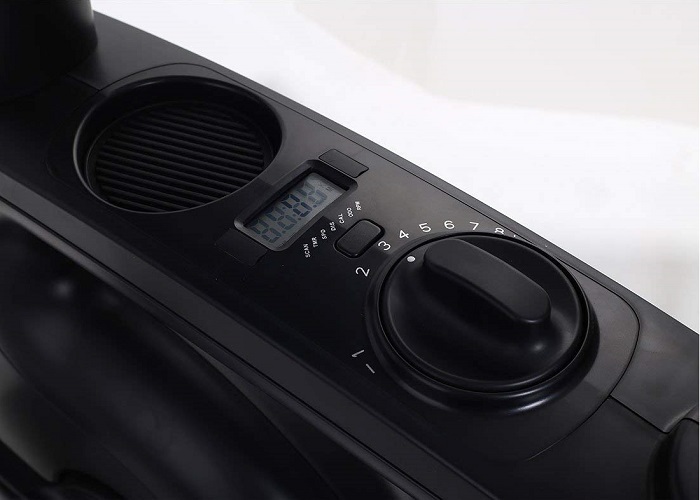 For better comfort, there are 4 points of adjustment that ensure you can find an appropriate setting for you while the included resistance levels are enough to suit even the most active users. The weight of the desk and a flywheel that provides adjustable degrees of magnetic pedal resistance make working while pedaling on Deskcise Pro very stable enough. You can type, click, scroll and generally do all the things you normally do without you realizing that you are cycling at the same time. Pedaling is smooth, and Flexispot have included some rubber covers to make it comfortable even in socks or bare feet. And when you get bored with cycling, you can stand around the other side of the desk and keep working. • Assembly took less than 5 minutes. • Pedals operate smoothly and quietly. • Locking caster wheels make it mobile. • Well built, sturdy bike platform can support users up to 300 lbs. • Stable enough to type or use a trackpad and still get a workout without realizing it. • No pulse reading function. • The laminate surface is too slippery. • The cycling computer doesn’t connect to an app on your phone to record workouts. 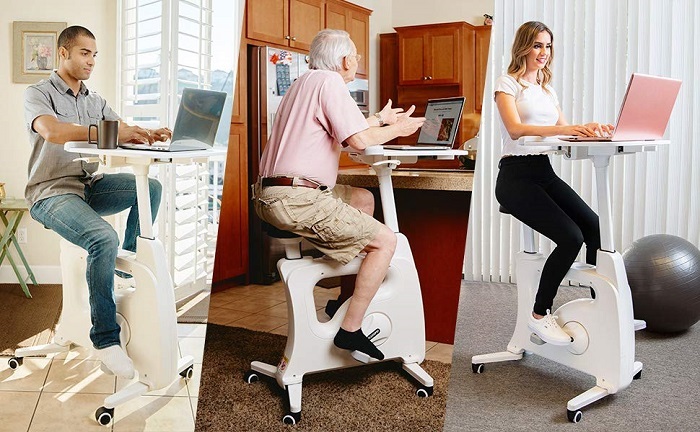 • You can use it as exercise bike or standing desk. • 8 levels of magnetic pedal resistance. 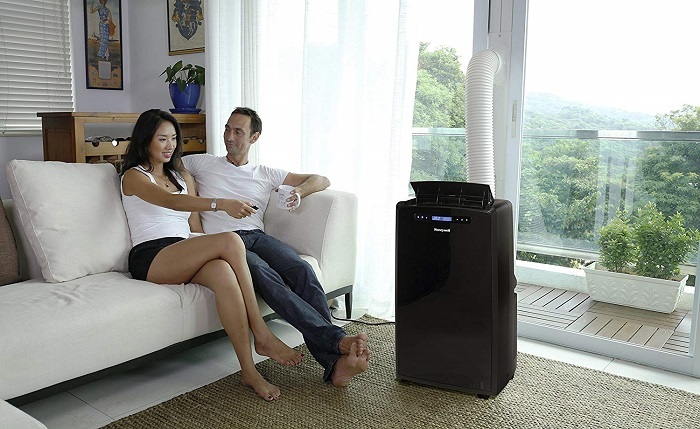 • “Whisper quiet” pedaling is ideal for home while watching youtube/TV, recreational webserfing/socmed or listening to music or even when snacking it seems excellent. 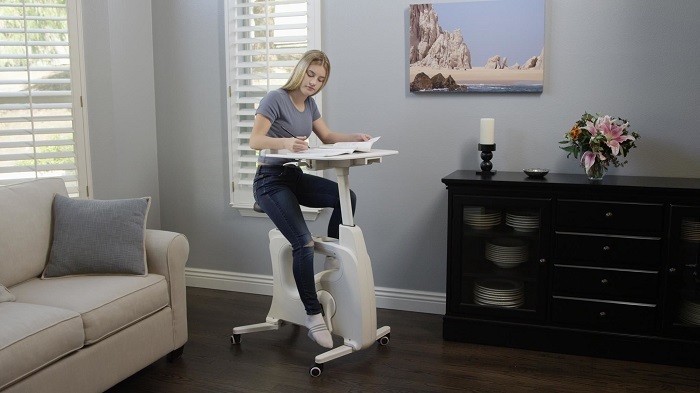 • Whether 5’1” or 6’2”, everyone in the family can comfortably use the cycle desk. • User-friendly pneumatic adjustment lever moves the desk bike seat up or down with a gentle press–no pins or knobs to adjust. • Thoroughly tested and specifically certified by TUV SUD. • Large desk surface to accommodate a laptop, notebooks and your mobile phone. 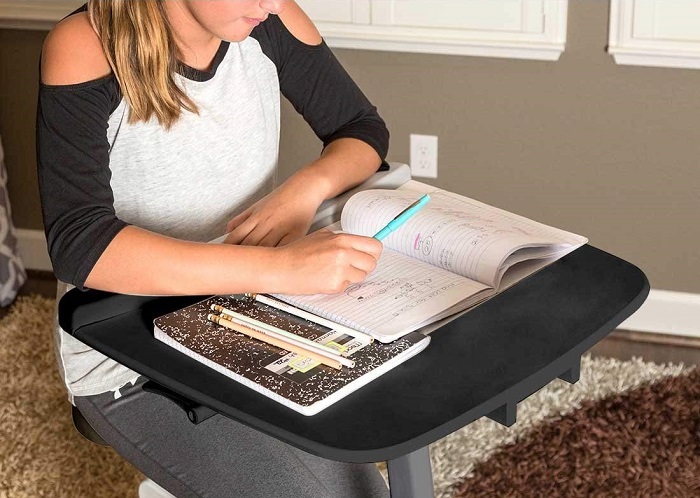 Flexispot Deskcise Pro help you to stay fit and burn calories while working on a laptop, reading a book, playing games, or even while watching TV. It`s a good option for those wanting to add activity to the sedentary work life.